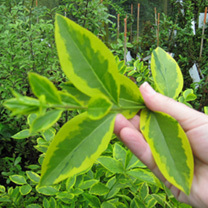 As a variegated hedge, golden privet provides lots of bright colour, through its bright green/golden foliage. It also has delicate cream flowers in the summer. A perfect option if you want the formality of a privet hedge with a splash of colour. Bare Roots supplied 60cm+ high and grow 20-40cm per year. As a variegated hedge, golden privet provides lots of bright colour, through its bright green/golden foliage. It also has delicate cream flowers in the summer. A perfect option if you want the formality of a privet hedge with a splash of colour. Bare Roots supplied 6in packs of 25 or 50, 60cm+ high and grow 20-40cm per year.